Hello and good day. I would like to ask for help in regards to a Korean dialog box I got after my game closed by itself while doing the tuning tutorial. It appeared when I tried to start again and I can see a time frame between 1/20/2015 23:00~23:30 which is actually right now. From what I can see, it's either there a maintenance or I got banned for... 30 minutes? I don't really know but I hope it's not the latter. I'd appreciate it if someone would translate it for me. Thank you. (01-20-2015, 11:30 AM)Yinada Wrote: Try launching now? Yes, I am able to login now due to the time frame given. I am just curious on what it says or if it only happened to me since it's my first encounter. That is a maintenance popup. Just wait until the bottom times to access the game again. 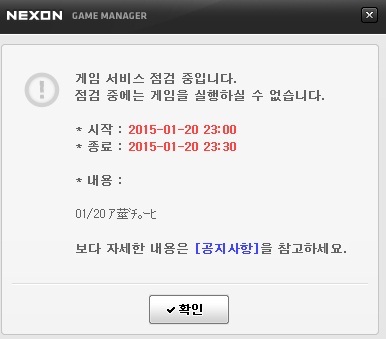 (01-20-2015, 11:58 AM)EternalDream Wrote: That is a maintenance popup. Just wait until the bottom times to access the game again. Also, to note the times shown are in Korean Standard Time (KST). You need to convert the times to your time zone. Thank you very much guys. I will note this down. Feel free to close my thread.